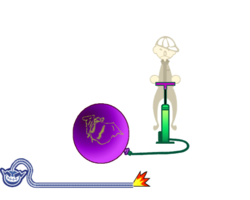 Info "Pump enough air into the balloon to make it pop! Hurry!" Come to Poppa is a Microgame in WarioWare: Smooth Moves. The name is a pun on the phrase "Come to papa". The player must pop a balloon by rapidly shaking the Wii Remote up and down. 1st level difficulty: The player must pop a balloon, and confetti will come out. 2nd level difficulty: The player must pop a rabbit shaped balloon, and doves will fly out. 3rd level difficulty: The player must pop a peach and Momotarō the Peach Boy will come out. This page was last edited on February 19, 2018, at 17:00.